Bulgaria is a new and very attractive golf destination which definitely will become extremely popular. Thanks to a number of spectacular courses and resorts, not to mention the hosting of a European Tour event (Volvo World Match Play Championship in 2013 at the Thracian Cliffs Golf Course), golf in Bulgaria is booming. 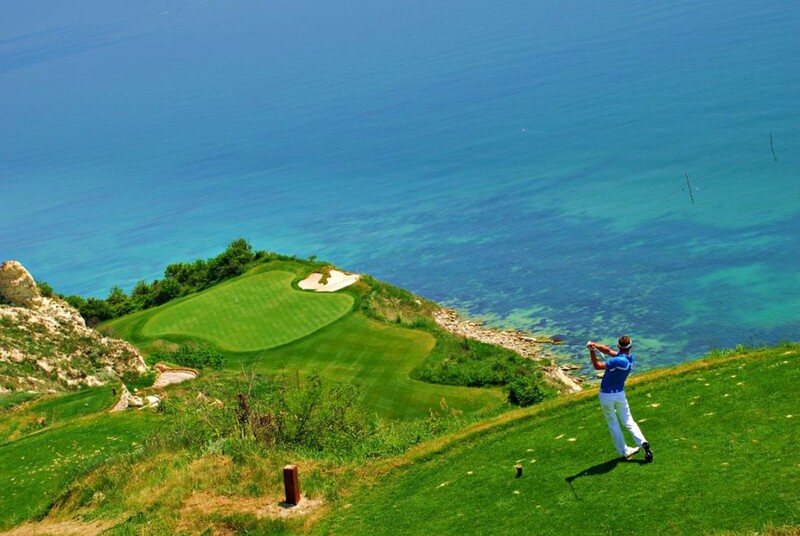 Three Golf courses by the Black Sea coast, some 50 km away from Varna. is the jewel of Gary Player’s portfolio for 2011. The 18-hole signature golf course forms the core of the resort. From every hole there is stunning view of the Black Sea coast. The 6th hole sits on top of the cliff with the green set some 40 m below. Another challenge is the 7th hole whose tee box is on a small island in the sea. This is the only Bulgarian golf resort which has its own beaches. The guests can relax at the elegant Thracian SPA, enjoying therapies with high-class cosmetics and typically Bulgarian natural products like yoghurt, honey, mud and wine. offers a 5-star hotel, 18-hole signature golf course designed by Ian Woosnam, a golf academy, 3,000 sq m Spa & Wellness centre, variety of bars and restaurants. Challenging, yet generous, the golf course offers beginners and experienced players a chance to test their golf skills and to please their senses. is a classic links golf course with remarkable views of the sea. It offers the very best of Gary Player’s style, said the US Masters champion Angel Cabrera after he played the course. The residential area consists of one or two-storey villas with 5-star hotel services. Own labels of wine are produced from the vineyards grown aside the fairways. Named ‘Best new course in the world 2009’ by Golf Inc.
is the closest golf club to Sofia – only 20 min from downtown. This is the first certified course in Bulgaria, holding an official rating by the EGA. Recently redesigned by the golf legend Paul McGinley, the club is a favorite location for corporate events and parties. The SPA centre uses mineral water, which is in abundance in this area. is a luxury resort situated only 40 min away from Sofia. Guests will experience luxury and coziness across every aspect of the resort, from the 18-hole championship golf course and the 4-star RIU hotel to the world-class SPA centre, casino, gourmet restaurant and night bars. The club offers a Peter Harradine designed 18-hole, par 72 championship golf course. The No8 hole is the signature hole with its challenging island green. Pravets Golf Club is managed by Braemar Golf – an international golf management company. is a 5-star resort. Huddled near the well-known Bansko ski resort, Pirin Golf provides a unique opportunity for a golf & ski vacation. The outstanding 18-hole, Par 72 championship course is designed by Ian Woosnam. The new 5-star hotel offers the largest SPA center in Bulgaria. Cape Kaliakra area is a perfect place for a one week golf vacation, while the inland golf courses are the perfect solution for short tours, or 3-4 days golf breaks. Why not experience a customized combination of all of them? Whatever your handicap is, we have a golf tour to suit you – just share with us your preferred golf holiday. Come and enjoy your new golf break while discovering a new destination!